For the third year in a row, the Rev. Jimmy Smiley of Reel For God Outreach Ministries and his wife, Caprice, will provide free Thanksgiving meals at Holy Trinity Church in Greenport. Thanksgiving is just around the corner and volunteers at the Holy Trinity Church in Greenport is using this holiday season as a chance to give back. A mysterious dinner party offers characters opportunities to remake their lives. Northeast Stage’s production of the J.M. Barrie play ‘Dear Brutus’ will be held April 10-12 and 17-19 at Holy Trinity Church in Greenport. 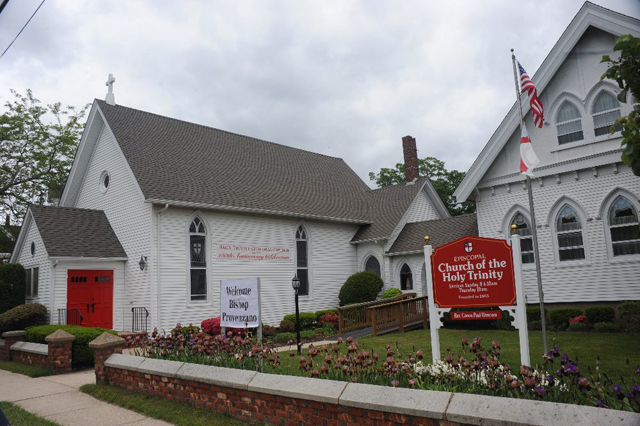 Tuesday, March 4, at 6 p.m.: Shrove Tuesday ham dinner at Holy Trinity Church, 768 Main St., Greenport. Baked ham with raisin sauce, homemade pea soup, sides, beverages and desserts. Donation: $25; $10, children under 12; children under 5 free. Group seating available. Carla, 477-0855. Mary Vienneau and Bob Kaplan rehearse a scene from ‘Hay Fever’ at Holy Trinity Church in Greenport. Northeast Stage presents “Hay Fever” by Noel Coward at Holy Trinity Church in Greenport beginning Friday night, Nov. 8. The adaptation of Noel Coward’s classic comedy, now set on the North Fork, features family and house guests combining in a comedy of bad manners and unexpected connections. James Pritchard is the director. Tickets are $15. Email [email protected] or visit northeaststage.org for more information.